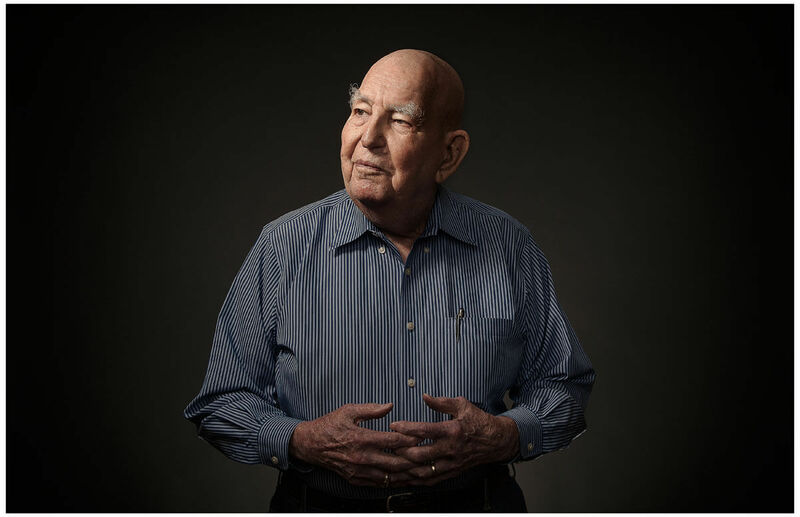 Portraits of WWII veterans captured by Austin, TX based photographer Dennis Burnett. I went to elementary school in Waco, Texas and met this beautiful girl named Evelyn who had the whitest hair and bluest eyes I’d ever seen. For five years we competed for the highest grades, then became sweethearts. In 7th grade her parents made us break up; she became a scholar, and I was a singer, so we moved in different circles after that. When WWII happened I volunteered for the Army Corp of Engineers; she married an Air Force pilot who got shot down six months later. She re-married and I married as well, but after her husband of 47 years and my wife of 65 years passed, we reconnected. I emailed her my condolences, and she invited me to her 80th birthday in Austin. She still had the letters I wrote to her when we were teenagers. I spent a year courting her from California, then proposed on my 82nd birthday, 73 years after we first met. Her husband had Parkinson’s and she had kind of settled into old age, but I got her out of that. We traveled, saw music and sports and had 10 wonderful years together. My secret to a long life is four ounces of good Scotch every night.